Nigeria has cleared the way for up to 1,500 troops to be sent to Sudan's troubled Darfur region. 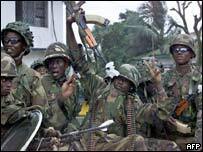 The senate voted to approve President Olusegun Obasanjo's plans for a peacekeeping force. A company of up to 150 soldiers is expected to be sent to guard ceasefire monitors. Two further battalions of 770 men could be despatched later. About a million black Africans have left their homes in Darfur, fleeing pro-government Arab militias. The initial deployment of Nigerian troops will make up a force of 300 African Union (AU) troops, joining the 150 Rwandan soldiers already in Darfur. The AU is considering whether to expand the force to 1,800 soldiers, though Sudan has not yet accepted this. AU-sponsored peace talks are due to begin on Monday in Nigeria, between the Sudanese government and two black African rebel groups it has been fighting in Darfur. Mr Obasanjo said of the senate's decision: "This is one more chance for us to show leadership and provide hope to millions of our brothers and sisters in Sudan." There is less than two weeks until a UN Security Council deadline for Sudan to quell the violence in Darfur or face economic or diplomatic penalties. Sudan denies backing the Arab Janjaweed militias and says the rebel groups are responsible for the crisis. The BBC's Barnaby Phillips in Darfur says aid agencies are reporting that an outbreak of Hepatitis E - a deadly disease for which there is no cure - has taken hold in refugee camps. On Tuesday, Sudanese Foreign Minister Mustafa Ismail denied there was an epidemic, saying: "The situation in Darfur has rather improved, according to the testimony of observers." On Wednesday, the World Food Programme announced it was stepping up its aid effort, airlifting almost 100 extra tons of food a day to refugees and others in need. The WFP said the rainy season was beginning "to bite", making aid deliveries much harder. The UN says there are now nearly 1.5 million people in need of help. Will election lead to south's split? Will Bashir let the south go? Will peace return to Darfur?